2400 MHz to 2500 MHz. in a high performance plastic package. RF performance at VDS = 32 V; IDq = 20 mA; Tcase = 25 °C in a class-AB application circuit. 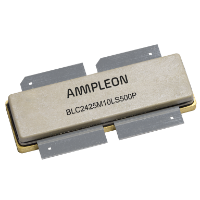 500 W LDMOS based power transistor suitable for use in a variety of commercial and consumer cooking, industrial, scientific and medical applications at frequencies from 2400 MHz to 2500 MHz. The BLC2425M10LS500P is designed for high-power CW applications and is assembled in a high performance plastic package.